This is the Death Star tribute Bluetooth speaker you're looking for! 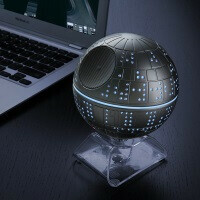 Leave it up to ThinkGeek, the last authority on Star Wars-themed gadgets, to turn our geeky dreams in reality and finally come up with the Death Star Bluetooth speaker we've been longing for. It's not perfect - it doesn't levitate like the Om/One speaker we've been lusting after, and its planet destroying might is yet to be tested. But for the most part, it's okay. YES I have to agree, this is pretty cool. For $70.00 I think it's a perfect gag gift for anyone who loves Star Wars! I don't think you know what the definition of a “gag gift" is. This has been around for a week or so...always out of stock. I have a (bad) feeling (about this) that production won't meet demands. it's better if it was floating speaker..